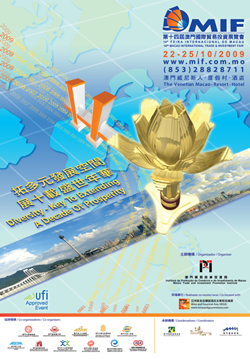 Macao International Trade and Investment Fair (MIF), organised by Macao Trade and Investment Promotion Institute (IPIM), is an economic and trade exhibition to promote international co-operation and exchange in investment and trade, as well as a prestigious annual event among the business sectors in Macao. MIF has been accredited by UFI (The Global Association of the Exhibition Industry) as an international investment fair, which is held every October in Macao. On the basis of Macao’s advantages in regional co-operation, and close ties with Mainland China, Portuguese-speaking countries and international connections, through the display of trade and investment opportunities, business partnerships, professional solutions, project matching sessions, investment negotiations and signing of co-operation agreements, MIF aims to promote interactive trade and investment activities, in order to foster the integration of funds, resources, markets and technologies, and takes a further step to advance entrepreneurial co-operation in multiple domains. Exhibition Area - MIF will feature comprehensive orientations to the investment environment, industrial structure and government policies of participating countries and regions. By collecting investment projects for matching, MIF contributes to the realization of investment and service projects co-operations. MIF is also making every effort to promote business partnerships exhibitions, particularly in the development of franchise business, patent transfer, brand licensing, agency business and technology transfer co-operation. Conferences and Business Negotiations - These mainly include the exhibitions of investment and trade opportunities, business partnerships, professional solutions, themed products, international trade and investment forums, international economic and trade co-operation conferences, professional seminars and presentations, and purchase negotiations. There will also be project matching, business matching and delegation matching. MIF cordially provides support to participating enterprises to look for new business partners and expand the scope of markets for development. Participating Organisations - MIF invites the participation of governments and enterprises through government economic and trade departments, trade promotion organisations, consulates, government trade commissions and commercial chambers. The Fair is especially suitable for businesses such as franchise, professional brands, and patent technology, producers and manufacturers, sourcing groups, financial corporations and exhibition companies, to take the opportunity of MIF to open up new channels for business development. Congregation of Business Sectors of Macao - MIF has always been strongly supported by the business sectors of Macao, who participated in the Fair through the organisation of themed pavilions, forums, conferences and ceremonies, highlighting MIF as a prestigious annual economic and trade event among the political and business sectors in Macao.